It’s ok that you can’t swim (though really, it’s time to learn), don’t know your port from your starboard, or just how to manage a compass bearing -- the ocean calls to you! And that’s just fine. You don’t need to know how to triage a sail, or fix a leak in the hull of the ship to be a seafarer. 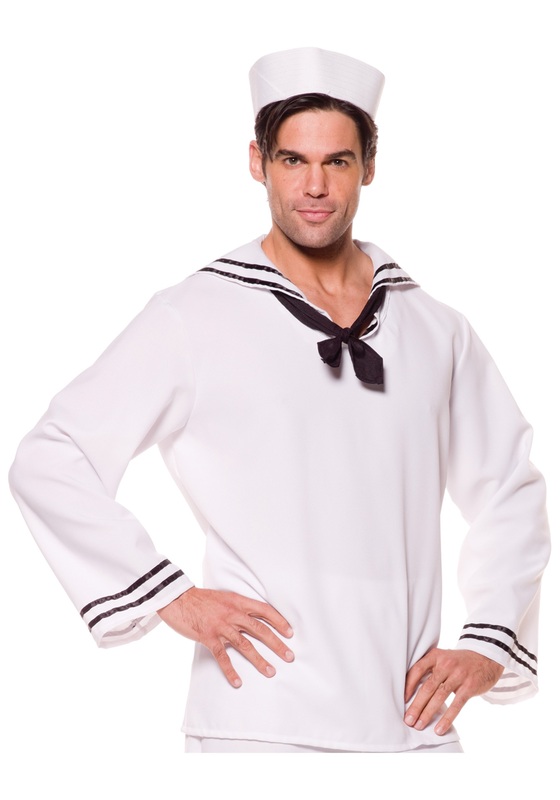 Just throw on this classic style Sailor Shirt and you’ll feel just like one of the crew. Complete with a hat and black scarf, this white shirt and long sailor collar is the perfect look for the calling in your salty soul. When you wear this shirt out, everyone will know you’re a person who knows his way around a boat, or the sea, or the ocean, or wherever the wind will take you! Just make sure that this perfect look doesn’t get you tangled up in a crowd of sailors on shore leave. You don’t want to accidentally pulled aboard a ship set for the high seas without first learning that crawl stroke!